Example content from Wikipedia, the free encyclopedia. The General Dynamics F-16 Fighting Falcon is a multirole jet fighter aircraft originally developed by General Dynamics for the United States Air Force (USAF). Designed as an air superiority day fighter, it evolved into a successful all-weather multirole aircraft. Over 4,400 aircraft have been built since production was approved in 1976. Although no longer being purchased by the U.S. Air Force, improved versions are still being built for export customers. In 1993, General Dynamics sold its aircraft manufacturing business to the Lockheed Corporation, which in turn became part of Lockheed Martin after a 1995 merger with Martin Marietta. 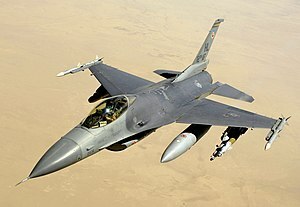 The Fighting Falcon is a fighter with numerous innovations including a frameless bubble canopy for better visibility, side-mounted control stick to ease control while maneuvering, a seat reclined 30 degrees to reduce the effect of g-forces on the pilot, and the first use of a relaxed static stability/fly-by-wire flight control system that makes it a highly nimble aircraft. The F-16 has an internal M61 Vulcan cannon and has 11 hardpoints for mounting weapons and other mission equipment. Although the F-16's official name is "Fighting Falcon", it is known to its pilots as the "Viper", due to a perceived resemblance to a viper snake as well as after the Battlestar Galactica Colonial Viper starfighter.